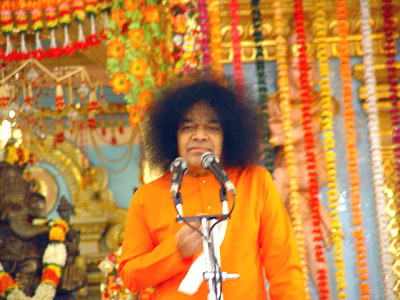 Swami indicates the significant role of His Teaching to the students - seekers of truth and to all others who are interested in their spiritual development. Let His words be as a preface to the subsequent Swami's lesson for devotees and followers "Swami teaches...". All of you have great love and adore Swami but that love and adoration are of no use if you ignore the teachings of Swami. Even if you do not adore, if you believe in the truth of the word and enforce it in your daily life, Swami's grace will always be with you in your life. It is no use if you simply utter the name of the Lord and do not follow the good things that go with the Lord. It is just like uttering the name of penicillin when you are running a high temperature. Only when you take in the penicillin will the temperature come down. When you are hungry, the hunger cannot be satisfied by uttering words like potato and Chapati. If you eat them, it will be satisfied. It is no use if you only read or listen. You must try to remember the teachings, put them into practice and judge for yourself how far you have acted according to the word. Swami teaches... today are little different and concludes Swami's advises to Bhaktha(s). They are quite long, written tens of years ago, but ever actual as guidelines for seekers the purpose of life and existence - the expression of the Divine. By my opinion these advises are as a summary for spiritual growth for all who longs for it. However, they are not only for reading, but more for inner contemplation, separately every point. They are also the discussion topics for satsanghs in good company of devotees. So, it makes 46 satsangh-discussions with pictorial examples of devotees experiences (it may be in frame of their culture and national customs what are in fact not other than diverse expressions of atmic unity of humanity). Reet. "Swadharmo Nidhanam Sreyaha, Para Dharmo Bhayaavahah". This means that in carrying out one's own Dharma, even if one perishes, it is far better than taking to Dharma not belonging to oneself. The latter path is beset with fear. We must try to first understand what Dharma i.e. Swadharma is. It means the path of the Brahman or the path of the supreme being. That thing that comes straight out of our heart must be considered as Dharma. Between Dharma and Sathya, there is yet another thing. The prompting that comes out of the heart or the feeling that emanates from the heart is called 'Rutha'. Rutha means the feelings and the ideas. They are of paramount importance. They set out all the guidelines for action and have a determining influence. So the feeling that has been shaped in the heart, when it comes in the form of speech, is called 'Sathya' or truth. If, whatever is implied in these words, is put into practice, that is called 'Dharma'. We can say that Dharma is that which is born from the heart, which is then expressed in the shape of words and then put into practice. Dharma is not a thing that can be determined by each and every person according to his whim. Some may say that the Dharma that comes out of one's heart is his Dharma; how can it become the Dharma of God? So, in your heart - not the physical heart but the spiritual heart, - you must try to locate and cognise the Atma Thatwa. The word 'I' belongs to Atma and never to the body. Thus, Dharma is that which comes from our heart and which is to be put into practice by us. We try to put into practice according to the ideals of our culture. Those things that will be changing from day to day are not real Dharma. Dharma is not changeable, it is eternal, it is immutable, it is truth. If it is changeable, why should we establish such a Dharma? Should we act according to it? The Kaliyuga offers multifarious paths through which a person can acquire discrimination or viveka. In spite of many schools and institutions we do not find any increase in human happiness or peace. We must try to make the best of our present age only and try to do good things and live happily in this world. Instead of feeling sorry for the bad things that are happening in this Kaliyuga, we must try always to be good and remove the bad from this world. The right way of leading a good life in this world is the spiritual, moral and ethical way. We must care for these three paths: the spiritual, the moral and the Dharmic. On what experience of these three paths depends? For this way of life, character is important. Character makes life immortal; it survives even death. Some say knowledge is power, but it is not true. Character is Power. Even the acquisition of knowledge demands a good character. Without character, wealth, education, social status, all these are of no avail. It is the fragrance of the flower; it gives value and worth. Poets, painters, scientists may be great, each in his own field, but without character, they can have no standing in society. Ordinarily, society attaches varying importance to certain qualities from day to day and fashions in character change with the vagaries of society. But the basic nature of a flawless character is eternal; it is the same, whatever the vicissitudes of society. In that sense, it is eternal, being associated with another immortal entity, the Atman. Among the qualities that make up a flawless character, Love, Patience, Forbearance, Steadfastness, Charity - these are the highest, these have to be revered. The hundred little deeds that we do every day harden into habits; these habits shape into intelligence and mould our outlook and life. All that we weave in our imagination, seek in our ideals, yearn in our aspirations, leave an indelible imprint on the mind. Distorted by these, we form our knowledge, our picture of the world around us, and it is to this picture that we get attached. By conscious effort, habits can be changed and character refined. Did not the thief Ratnakara become Valmiki, the sage? 'Prarabhda Karma and Sanchita Karma', the consequence of all our actions, is also interconnected with our character . We should not try to worship God only for the sake of overcoming the consequence of all our actions. If you worship Him to get His grace, Prarabhda, Sanchita and all other Karma will become ineffective by themselves. Before trying to rectify these things, first try to know what is Prarabhda, what is Sanchita and what is Agami Karma. Prarabhda Karma is that which we are presently undergoing and experiencing. Sanchita means all the past Karma, Agami refers to Karma that will follow in future. Prarabhda is in between the Sanchita and Agami, and we are experiencing this Prarabhda on account of the previous Sanchita Karma. The result of what we do now will come in future. I shall give you a small example from our daily life. We have got a storeroom in which we stock all our rice. We have already the old stock of rice in the store. What we have stored in the room is called Sanchita. When we want to cook, we remove some rice from the storeroom and begin to cook it. What we bring from the storeroom for cooking today is called Prarabhda. What we cook now and what we eat today will pass out of our body tomorrow. Sometimes what we eat may come out in the shape of a belch. Therefore, we cannot escape from Prarabhda, we must experience it in this life. In the storeroom, there is only rice. When we bring it we will be able to convert it into many preparations. In this way, we can make the rice into food. We never change the base which is always rice. Even though there is Sanchita, if you try to behave in a Sathwic way, in a pious and good way, you will be able to change even Sanchita. You may say that in the rice store, there are also stones. They are as the result of our bad actions. They are in the store mixed with rice. Before we cook, do we not try to remove the stones from the rice? So it is quite necessary that when we experience Sanchita, we can overcome the bad effects to some extent or a great extent and make them clean, just as we make the rice clean. We need not be afraid of Prarabhda or Sanchita. If we think that the effect of the Prarabhda Karma is inescapable, then what is the use of worshipping God? Even though Prarabhda is there, the grace of God will certainly remove to a large extent the bad effects from the Prarabhda. Here is a small example for this. There is an injection bottle. It will be written on that, that the medicine inside can be used up to 1970. That bottle is there even in the year 1972 and the medicine is also there in the bottle, but the medicine will have no power. In the same way, in our destiny there may be the medicine or Prarabhda but by the grace of God we can weaken its effect, blunt its effect. Even though it is there, it cannot trouble us. We can become beneficiaries of God's grace; we need not be afraid of either Prarabhda or Sanchita or Agami. Therefore the most important thing we have to try is to earn the grace of God by which we can overcome all these bad effects. (Reet's compilation from: Sathya Sai Baba. Divine Discourse during the Summer Course in Spirituality and Indian Culture, "Destiny and Divine Grace." May, 1972. Brindavan. Sathya Sai Baba. Prema Vahini. "Noble Qualities From The Path For The Aspirant." Page 1). (Ancient sages developed the skill to direct their visions as "beyond the brain''. By Upanishads there was the Universe inside a human being. It was as light within oneself. The good company illuminates as many spiritual lights within what through experience from "the material to the spiritual" lead every member of company to the eternal Atmic Unity*). Birth is the result of the karma done before death. This is no religion of despair; it is a religion of hope, of assurance, of encouragement to lead an active, useful, beneficent life. For the future is in your hands; tomorrow can be shaped by today, though today has already been shaped by yesterday. That is the reason why the biggest section of the Vedhas is called 'Karma Kaanda' and deals with various types of Karma. The Thaittireeya Upanishadh takes the student from the gross to the subtle, step by step, in its effort to teach him the Divine Principle. When Bhrigu, the son of Varuna, approached his father, saying, "Teach me Brahman," he was told in a general way, "Brahman is that from which all this originates, that in which they live, and that in which they enter when they depart," and he was asked to investigate it through meditation himself. with Aanandha (bliss); thus the Upanishadh teaches the subtle, supreme, non-dual Bliss, hidden in the cave of the heart. From the material to the spiritual - that is the process of Upanishadhic teachings. The lasts are experiencing through good company. Avoid the bad company, what causes misfortune to you. Once there was a hunter who had captured a baby bear and who brought it up as his pet with great love and care. The bear too reciprocated his love and behaved like a good friend for many years. One day, when he was traversing the jungle with his pet, who had grown up into a hefty beast, he felt overcome by sleep; so he laid himself down on the grass, asking the bear to see that he is not disturbed. The bear kept watch very vigilantly. It noticed a fly that flew round and round and settled on the nose of the master. The fly went off when it waved its thick heavy hand; but, it came again, and settled on the nose. The bear got enraged when repeated waves of the hand did not teach the fly that his master's nose was not the fly's resting place. At last, the bear could not bear the insolence any longer! His heavy palm came down with a thump on the nose, a devastating whack! The master died on the spot! That is the consequence of keeping company with the wild and the foolish. However affectionate they are, their ignorance will land you into disaster. When the mental resolutions take a bad turn and when you are then in the company of a bad one, your condition becomes worse on account of plus getting added to plus. The result is disaster. When your intentions and resolutions are good, and when you join the company of the good, you can progress faster. The company of the good is like the noon-time shadow. It is short in the beginning but lengthens as the evening comes on. The company of the bad one is like the morning shadow. It is long when the day dawns, but becomes shorter as noon approaches. The comradeship and conversation of the undesirable appear sweet and profound in the early stages, but the effect is only pollution of minds and hearts. Shankaraachaarya has emphasised the value of the company of the good to persons on the spiritual path, for it leads man to immortality. From Un-moving Truth to Eternal Liberation. "Immortality can be attained, not by ritual deeds, nor by birth, nor by wealth, but only by sacrifice and renunciation". This is the declaration of the Vedhas. Giving up the little 'I' is what renunciation or thyaaga means. Thyaaga does not mean running away from hearth and home into the jungle. It means sublimating every thought, word and deed as an offering to God, and saturating all acts with Divine intent. Seva is the highest Saadhana for, God Himself takes human form and comes down to serve mankind and lead it to the ideals it has ignored. Therefore consider how delighted God will be when human being serves human being! Life is short, it is liable to be cut short any moment. The body may fall and release you, without notice. So while you can, you must dedicate the heart to Him who gave it to you. Your heart is your witness; question it whether you have obeyed the directions of the Lord. A thousand persons may swear that you have not, but if your conscience affirms that you have, you need not fear. You may ask, "Swaami! When you find a person behaving wrongly, viciously, how can we love him? How can we revere him, as you want us to?" In such a situation consider one thing: Who is it who committed that wrong? What is it that prompted the act? Who did the deed? The body did it. What prompted the body? The mind. Why was he forced to do it? Through the influence of his karma, the cumulative effect of his activities and attitudes through many lives in the past. The Aathma in him is unattached, to any deed or motive. That Aathma is Divine; love that, revere that. That is My answer. There are two obstacles which prevent person in this valuable effort. The first is the tendency to compare yourselves with others. This is very wrong. No two things or no two persons are identical. Even identical twins grow in distinct ways of life. Each with his distinct nature, quality, potentiality and destiny. How, then, can any one compare himself with another and either exult or despair? We are proud that we are better than others. All this is very silly when we come to think of it. Secondly, we are in the habit of justifying our faults, rationalising our errors and avoiding the responsibility of facing them squarely and correcting them. These two attitudes thicken man's ignorance and breed further failings. Every one has God as the source. No one is higher or lower. (Reet's compilation from: Sathya Sai Baba. Sathya Sai Speaks: Vol. 7, "Not Loka but Lokesha," Chapter 5 and "The wet wick", Chapter 39. Vol. 15, "Two kingdoms with one king," Chapter 36 and "Eternal harmony," Chapter 8. Vol. 16, "The daily prayer," Chapter 2). * My comments always in brackets in black. Listen carefully, I shall tell you. 1. Prema, love, should be considered as the very breath of life. 2. The love that is manifest in all things equally, believe that the same Prema is Paramathma. 3. The one Paramathma is in every one, in the form of Prema. his love on the Lord. 5. Such love directed towards God is Bhakthi; that is the fundamental test, the acquisition of Bhakthi. 6. Those who seek the bliss of the Atma should not run after the joys of sense objects. 7. Sathya, truth, must be treated as life-giving as breathing itself. 8. Just as a body that has no breath is useless and begins to rot and stink within a few minutes, similarly, life without truth is useless and becomes the stinking abode of strife and grief. 9. Believe that there is nothing greater than truth, nothing more precious, nothing sweeter and nothing more lasting. 10. Truth is the all-protecting God. There is no mightier guardian than truth. 11. The Lord who is Sathyaswarupa grants His Darsan to those of truthful speech and loving heart. 12. Have undiminished kindness towards all beings and also the spirit of self-sacrifice. 13. You must also possess control of the senses, an unruffled character and non-attachment. 15. Try to prevent the five sins that the body commits: Killing, adultery, theft, drinking intoxicants and the eating of flesh. It is a great help for the highest life if these also are kept as far away as possible. 16. One must be always vigilant, without a moment's carelessness, against the eight sins that the mind perpetrates: Kamam or craving; Krodham or anger; Lobham or greed; Moham or attachment; impatience; hatred, egoism, pride. human's primary duty is to keep all these things at a safe distance from himself. 17. Human's mind speeds fast, pursuing wrong actions. Without letting it hurry like that, remember the name of the Lord at that time or attempt to do some good deed or other. Those who do thus will certainly become fit for the Lord's grace. 18. First give up the evil tendency to feel envious at the prosperity of others and the desire to harm them. Be happy that others are happy. Sympathise with those who are in adversity and wish for their prosperity. That is the means of cultivating love for God. 19. Patience is all the strength than man needs. 20. Those anxious to live in joy must always be doing good. 21. It is easy to conquer anger through love, attachment through reasoning, falsehood through truth, bad through good and greed through charity. 22. No reply should be given to the words of the wicked. Be at a great distance from them; that is for your good. Break off all relations with such people. 23. Seek the company of good men, even at the sacrifice of your honour and life. But be praying to God to bless you with the discrimination needed to distinguish between the good men and the bad. You must also endeavour, with the intellect given to you. 24. Those who conquer states and earn fame in the world are hailed as heroes, no doubt; but those who have conquered the senses are heroes who must be acclaimed as the conquerors of the universal. 25. Whatever acts a good or bad man may do, the fruits thereof follow him and will never stop pursuing him. 26. Greed yields only sorrow; contentment is best. There is no happiness greater than contentment. 27. The mischief-mongering tendency should be plucked out by the roots and thrown off. If allowed to exist, it will undermine life itself. 28. Bear with fortitude both loss and grief; try and search for plans to achieve joy and gain. 29. When you are invaded by anger, practise silence or remember the name of the Lord. Do not remind yourself of things which will inflame the anger more. That will do incalculable harm. 30. From this moment, avoid all bad habits. Do not delay or postpone. They do not contribute the slightest joy. 31. Try as far as possible within your means to satisfy the needs of the poor, who are really Daridranarayana. Share with them whatever food you have and make them happy at least that moment. 32. Whatever you feel should not be done to you by others, avoid doing such things to others. 33. For faults and sins committed in ignorance, repent sincerely; try not to repeat the faults and sins again; pray to God to bless you with the strength and the courage needed to stick to the right path. 34. Do not allow anything to come near you, which will destroy your eagerness and enthusiasm for God. Want of eagerness will cause the decay of the strength of man. 35. Yield not to cowardice; do not give up Ananda. 36. Do not get welled up when people praise you; do not feel dejected when people blame you. 37. If among your friends any one hates another and starts a quarrel, do not attempt to inflame them more and make them hate each other more; try, on the other hand, with love and sympathy to restore their former friendship. 38. Instead of searching for others' faults, search for your own faults yourself; uproot them, throw them off. It is enough if you search and discover one fault of yours; that is better that discovering tens of hundreds of faults in others. 39. Even if you cannot or will not do any Punya or good deed, do not conceive or carry out any Papa, or bad deed. 40. Whatever people may say about the faults that you know are not in you, do not feel for it; as for the faults that are in you, try to correct them yourself, even before others point them out to you. Do not harbour anger or bitterness against persons who point out your faults; do not retort, pointing out the faults of those persons themselves, but show your gratitude to them. Trying to discover their faults is a greater mistake on you part. It is good for you to know your faults; it is no good your knowing others' faults. 41. Whenever you get a little leisure, do not spend it in talking about all and sundry, but utilise it in meditating on God or in doing service to others. 42. The Lord is understood only by the Bhaktha; the Bhaktha is understood only by the Lord. Others cannot understand them. So, do not discuss matters relating to the Lord with those who have no Bhakthi. On account of such discussion, your devotion will diminish. 43. If anyone speaks to you on any subject, having understood it wrongly, do not think of other wrong notions which will support that stand but grasp only the good and the sweet, in what he says. True meaning is to be appreciated as desirable, not wrong meaning or many meanings, which give no meaning at all and cause only the hampering of Ananda. 44. If you desire to cultivate one-pointedness, do not, when in a crowd or bazaar, scatter your vision to the four corners and on everything, but see only the road in front of you, just enough to avoid accidents to yourself. One-pointedness will become firmer if one moves about without taking one's attention off the road, avoiding dangers, and not casting eyes on others' forms. 45. Give up all doubts regarding the Guru and God. If your worldly desires do not get fulfilled, do not blame it on your devotion; there is no relationship between such desires and devotion to God. These worldly desires have to be given up some day or other; Bhakthi feelings have to be acquired some day or other. Be firmly convinced of this. 46. If your Dhyanam or Japam does not progress properly or if the desires you have entertained do not come to fruition, do not get dispirited with God. It will dispirit you even more and you will lose the peace, however small or big, that you might have earned. During Dhyanam and Japam you should not be dispirited, desperate or discouraged. When such feelings come, take it that it is the fault of your Sadhana and endeavour to do them correctly. (Extract-compilation from Sathya Sai Baba. Sandeha Nivarini. Dialogue VII). The essence of the Sama Veda is the Pranava (Om). Omkaaram Sarva Vedaanaam - the scriptures have also declared that Omkaara (the sacred syllable Om) is the supreme mantra in the Vedas. The single syllable "Om" symbolises the Paramatma (Supreme Omni-Self). The sage Vyasa first taught the Sama Veda to Maharishi Jaimini. Further in the process it developed many saakhas (branches). Out of the one thousand branches which stemmed from the Veda, today only three have survived among its practioners. The others have been lost by the ravages of time. The pranava mantra is all-pervasive and ever-present. There cannot be a single moment when we are not listening to this pranava. The Pranava is present in every living being. The Pranava is the primordial sound on which all sounds are based. The Pranava has been equated with the Brahman (the Cosmic Self). The Vedic dictum, Ayam Atma Brahma (This' Atma is Brahman) points out that Atma and Brahman are one and the same. Hence Om, Brahman and Atma signify the same entity. Every human being experiences four states of consciousness in daily life; Jagrata (the waking state), Swapna (dream state), Sushupti (deep sleep) and Turiya (the highest state of consciousness). The waking state is the state in which one sees and experiences the phenomenal world through the five life-breaths, the senses, the mind, the intellect and the ego. Without the Atma, the waking state or experience of the phenomenal world cannot exist. Hence the Atma in this state is known as Viswa. It is also called Vaiswanara or Viraatpurusha. Krishna is stated to have revealed to Arjuna His Viswaroopa (cosmic form). The Atma that appears in the waking state as the phenomenal cosmos in its gross form, appears in the dream state in its sookshma (subtle) form. All the joys and sorrows experienced in the dream state are unique self-created experiences of the Atma. In the third state of Sushupti, the experience of the waking and the dream states are absent. It is the state of deep sleep. In this state Prajna (integrated awareness) alone exists. Only the breathing process remains. Prajna is the state of unchanging and permanent bliss described by the Upanishads. Prajna is the permanent entity that exists equally in the waking state as the body, in the senses as the Antahkarana (the Inner Motivator) and in the deep sleep state as Atma. It is for this reason that it is characterised as Constant Integrated Awareness. It is not different from Brahman or Atma. A doubt may arise that neither Brahman nor Atma is visible. But by understanding the Pranava, the identity of the Brahman and Atma can be experienced. All that is seen in the visible universe, all that is heard in the realm of sound, all the multifarious experiences of the heart - all of them are subsumed by the Pranava. Even in the state of deep sleep, the process of breathing in and breathing out goes on ceaselessly. That which sustains the breathing process is Omkaara, which thus proclaims Its identity with the Brahman and the Atma. The fourth state is Turiya. This is a state of complete ineffable Bliss in which the Universal Consciousness alone is experienced. It is beyond description. Like the four states of consciousness, the Omkaara has also four constituents. It is viewed as the four-faced Brahma. It is also described as Sabda-Brahmam, the Brahman in the form of cosmic sound.The Sabda-Brahmam contains Gaana-Brahmam (the Brahman as music). The Sabda-Brahmam pervades everywhere. The allpervasive character of Sabda-Brahmam is first among eight cosmic powers attributed to the Divine. (Even the modern science has discovered that the cosmic sound accompnies whatsoever cosmic events in galaxies and in cosmic space between them. About it some contributions to the group has sent). The cosmic power of the sound can be known when the Sama Veda and Pranava are properly understood. This knowledge cannot be got by external exploration. It has to be got from within. The Lord, who is manifest in Cosmic Sound, is present within as Pranavakaara (the form of Pranava). For nourishing this faith, it is necessary to abjure impurity in speech. There is great energy in the power of speech. In uttering mantras (sacred sounds), their meaning should be understood. Otherwise the japa (repetition of Divine Name) becomes mechanical ritual. A human being needs primarily two qualities' Devotion to God and the spirit of sacrifice. Your job is no doubt important for earning a living. But you must be prepared even to sacrifice it for serving the nation and upholding Truth, with faith in God. Realise the omnipresence of the Divine in the form of Omkaara, as proclaimed in the Sama Veda. Practise Omkara Upasana (meditation of the primal sound principle) with the consciousness that the Divine is omnipresent and achieve mergence in the Divine as the goal of human birth. To recognise the Omni-Self that is in every being is Self-realisation. Today people boast about the tremendous progress of science and technology, but if this claim is true, why does ajnana (ignorance) persist on such a large scale? Good thoughts, good words and good actions are absent today. People frequently are behaving in a manner worse than that of animals. There are fleeting moments of devotion, but these are more demonstrative than genuine expressions of faith in God. Unless faith in God expresses itself in a Godly life, it is sheer hypocrisy. "Sai Ram" in words any dishonesty in thoughts is brazen deception. "Sai Ram" must emanate from the depth of one's being. Develop fraternal feelings towards all. Differences of opinion can be resolved by compromise. If egoistic pride is given up, all difficulties can be overcome. Live up to Swami's teachings as far as possible and thereby redeem your lives. (Reet's compilation from: Sathya Sai Baba. Sathya Sai Speaks Vol. 20, "Pranavopaasana," Chapter 24 and "Transformation is what I want," Chapter 25). The process of living is the swinging of a pendulum from smile to tear. Childhood is too tender and innocent; youth is too full of folly and faults, middle age is muddled with problems and possible remedies; old age is spent in regret over past failings and falterings. When can an individual taste some little sincere joy? Nature is the vesture of God. It images the Supreme. It shines through the machinations of the mind. The inner core of each living thing is God. Joys and sorrows are the results of the mind's involvement in the transient and the trivial. Give up what has to be cast away, know what has to be attained, then, Aanandha becomes your unruffled nature. So give up the idea of the world being valid; know the reality of the Self and attain the Source, the Brahman. This is the significance of the Upanishathic Prayer. This is a prayer asking to be led from the Jagath (mundane world), which is constantly being built and rebuilt, resolved and dissolved, into the Divine whose Being undergoes no change. The darkness symbolises the ignorance which induces identification with the body-senses-mind-reason complex. The light reveals the Divine core, over which all the rest is superimposed by the fog of faulty vision. Death affects only the body-mind complex. When we are led into the light, we become aware that we are the undying Aathma, and so we become immortal. It may be said we are praying every day. But prayer is not the pronouncing of words. Prayer is the yearning one experiences to awaken the divinity latent in the heart. A heart without words is far more precious than words without a heart. Words cascade from the tongue but they are mere froth. People blabber a billion words but never do a deed. Be examples in doing, not doling out advice. Revere the world as divine; "Yaccha kinchith jagath sarvam drishyathe shruyathepi vaa," says the Upanishadh. It means, "All that is seen or heard is God." "Anthar bahischa thath sarvam, vyaapya Naaraayanah" - The inner world and the outer world are both immersed in God. "OM Thath Sath", the Upanishadhs declare. "Thath" is That, the Cause "Kim yath thath" - these three words are to be thought over. Kim (what?) yath (which?) thath (that). Thath is the Brahma principle. Thwam (you) is the Effect, the Jeeva, the Individual. Prayer must emerge from the effect to the cause. The individual self has to yearn for the Supreme Self. It must emerge from a pure heart. Prayer (drinking cup) must be clean both on the outside and the inside. Prayer should not arise out of the tongue, as music rises out of a gramophone record. When the song does not come from your depth, when you are not involved in it, how can it draw God unto you? Your self must achieve confidence. Then, that self-confidence will lead to self-sacrifice and self-realisation. We must delve beyond the body, beyond the senses, beyond the mind, beyond the intellect and reach the source of all these - the Aathman. It is the substratum, basis and source of all else. For everything we see there has to be a base, which we do not see. For the car that is moving, there is the road, which is the stationary ground for the car to move on. The car may swerve but the road does not swerve. If the road also moves, what journey can the car make and whereto? So also, the Aathman is the basis for the functioning of the mind and senses and body. A human being marches from the status of self to the all-inclusive Self, from Aathma to Paramaathma. Towards the success of that march, all Nature can provide advice and guidance until the very end. The real Guru one must rely upon is Nature, saturated with God. God does not teach us direct; He teaches us through Nature which surrounds us. So, do not renounce the world or condemn Nature. Do not restrict the God of the Universe to any one Name and Form. Love all names and forms. Expand your letter world-wide. The Universe is a manifestation of God. So also is the 'individual. All these three are like Brahma, Vishnu and Maheshwara, the Trinity. Actually there are no Three, they are one, it is unified Godhead. Every cell in the human body is God, though under a microscope you cannot find Him. A pure heart, a cleansed mind, a God-filled consciousness will help you to listen to the voice of the God within you. The words above shine from Aathma Vidhya what is only the true education. The education today is (mainly) oriented towards earning money only. For feeding a small stomach, should one have to learn so many things? There is knowledge of music, knowledge of arts, science, etc. But all pale off into insignificance in the light of the knowledge of the spirit. All other branches of knowledge are like rivulets which flow into the sea. (nadeenaam saagaro gatihi). Just as all rivers flow into the ocean, all types of education will find their true fulfilment when they lead and end up in spiritual knowledge and wisdom only. You should not think that worldly life and spiritual life are different. Do not make such distinctions like spiritual life is sugar and worldly life is tasteless water. You have to stir the water in the glass, and let the sugar at the bottom dissolve well; then enjoy drinking the sweet mixture. In this way, worldly life should be blended and harmonised with spiritual life. (Reet's compilation from: Sathya Sai Baba. Sathya Sai Speaks Vol. 15. "The Universe - the Guru," Chapter 15, "Eternal harmony," Chapter 8 and Vol. 16, "The daily prayer," Chapter 2). * The spelling what in Swami's texts has used was not changed. Over the years there were many who recited the Vedas and carried on Vedic practices, no commensurate results were achieved? It is because, few of them understood their inner meaning properly, or their sacredness and potency. It may be that the sacredness of the Vedas is such that even mere uttering the mantras without understanding their full meaning or merely listening to them will have some sanctifying effect. The potency of the Divine vibrations emanating from the mantras is such that they confer unique blissful experience on the listeners. Divine potencies attributed to Vedic mantras, sravanam (listening) is considered the foremost. Likewise, among the nine forms of devotion, sravanam (listening to the glories of God) has been accorded the first place. Any action done with a pure heart becomes holy. Mantra means that which is established in the manas (mind) by a process of trana (rumination). The Vedas have shown the different means by which this mental state can be changed. They declare: "Perform Satkarmas" (good and righteous deeds). They include Yagas and Yajnas and charitable undertakings. All actions done as an offering to God can be regarded as Satkarmas. The purpose of the Karmakanda of the Vedas is to indicate the kind of actions and rituals that will serve to purify the mind. The human body is subject to afflictions from three sources: Vaatha (the wind element in the body), Pitta (bile) and Sleshma (phlegm). Hundreds of ailments arise from these treee sources. Just as the body is subject to ills arising from vaatha, pitta and sleshma, the mind also is liable to ailments from three sources: mala, vikshepa and aavarana. 'Mala' means that which is impure. As a state of mind 'mala' refers to the condition in which one regards the impermanence, the false and the unsacred as permanent, true and holy. Mala is also known by the term Avidya (ignorance). Ignorance can be removed by karmas (prescribed actions). Vikshepa (delusion) is removed by developing the power of discrimination. Aavarana (that which covers or envelopes an object) can be removed by Upasana (worship). Upasana (devotional worship) one-pointed concentration of mind is promoted. And through Jnana, moksha (liberation) is attained. Devotion means friendship with God, establishing close relations with God through love. Service to God is the essence of devotional worship. Satkarma (right action) results in purity of mind and devotion promotes concentration. The third stage is jnana (knowledge). There are different kinds of knowledge. One is worldly knowledge. Another is general knowledge. What is implied by the Vedic term Jnana is knowledge of Atma. It cannot be taught by preceptors or learnt by studying texts. It cannot be received from any one or offered to any one. It has to emerge from the inner consciousness. Preceptors and texts can only help to some extent. To become a Jnani (a fully Self-realised person). the first step is to start with the Karma Marga (path of Action). The sacred duties laid down in this discipline have to be practised. Without doing the prescribed rites, merely declaring the actions one performs as offerings to God is futile. If you are unable to ascertain what actions the Vedas prescribe, act according to the dictates of your conscience. Thereby your actions get sanctified. The Vedas have taught the means to make life in the world pure and meaningful. They have declared: "Na karmanaana prajayaa dhanena, thyaagenaike amrutatwamaanasush" (not through rituals, progeny or wealth, but only through sacrifice can immortality be achieved). Vedas have indicated the means for experiencing many temporary pleasures. The Vedanta has shown how by a process of elimination - Neti (Not this) you arrive at what remains, namely, the Atma. When you find out that what you call the "I" is different from what you describe as your body, your mind etc., what remains is the "I" which is the Self, the Atma Principle in you. This is the message of Vedanta. Likewise waves in ocean in action, all the myriad beings in the world have their different names and forms but are all tiny droplets from the infinite ocean of Sat-Chit-Ananda (The Cosmic Being-Awareness-Bliss). The Spirit is One in all beings. Our sense organs are not the Atma (Spirit). The divine Spirit possesses all the potencies of the senses. It is this Divine sweetness that illumines the world. This Beauty, Sweetness and Bliss are all within you. When you turn your mind to God, the whole universe will wear a new aspect. Without this internal change, all changes in the external physical world are of no avail. Only when the individual changes, the world will change. (Reet's compilation from: Sathya Sai Baba. Sathya Sai Speaks Vol. 22. "Karma, Upasana and Jnana," Chapter 30 and "Power of the Spirit," Chapter 22).